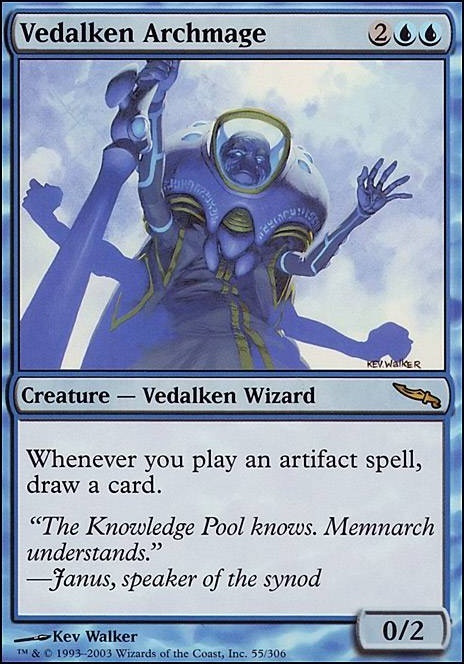 @Saljen I don't like the Vedalken Archmage since it costs 4, but the other suggestions seem pretty cool, espceially the Scrap Trawler and Mind Stone . Grim Lavamancer is a good idea if I get rid of Slag Fiend , and Dark Confidant seems really good! As for Seismic Assault , I would probably use Molten Vortex over it since it is not 3 red mana, which can be hard to cast. I have returned to point out a card that has performed above expectations. Mirage Mirror . Was on the fence about that one for a while. I finally decided to give it a shot. It can do a lot. Threatening to become one of your opponents baddies to attack/block with. A chance at double coat of arms. It can change into another permanent type to dodge artifact destruction (damn that Vandalblast !). It has even saved my hide by becoming a Tomb of the Spirit Dragon ! Need to double up on value like Vedalken Archmage , or Endless Atlas ? It can do that. 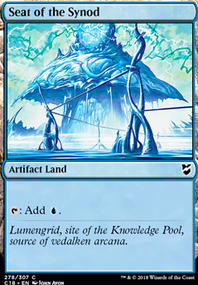 I know you don't run it, but I have used it to copy Ugin's Nexus using the legend rule to bin the original nexus and get an extra turn (as the mirror stops being a nexus before your extra turn would start) Being able to copy one of your opponents cards can be really strong(personal favorite was cloning a Wound Reflection for just enough to kill my opponent when I would have lost if he untapped). sorry about the wall of text, but it's a fun card to run in an artifact shell. I have used Whir of Invention to tutor it up more times than I ever thought I would. Have you considered Vedalken Archmage for this deck? 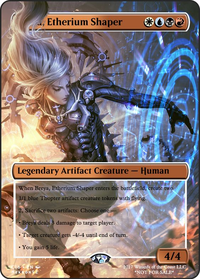 I'd run it in my Jhoira deck but, my mana is too tight and it would add a 3rd 4cmc card which, I would rarely ever cast. However, the chance of doubling up on draw triggers seems like it would be pretty amazing! Also, Sensei's Divining Top with any of your reducers will allow you to double draw. Play Top for 0 then cast another artifact and use Top's draw ability in response. Draw a card with Top then draw Top! it's one of my favorite things to do in my Jhoira deck. 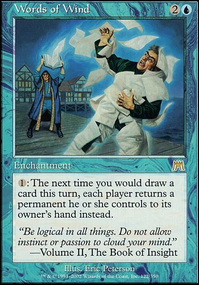 Words of Wind is another solid option that can act to generate infinite mana with Mana Crypt or Mana Vault while bouncing your opponents' board states. It can also generate the infinite with Sol Ring and Grim Monolith if you have a reducer online. I like Seismic Assault, as there isn't much reason for you to continue dropping lands past 4. With all the inherent draw from the 0/1 drop artifacts, you'll quickly pick up a hand of 5+ lands, so when you draw into the singleton Seismic Assault you can finish the opponent off. I also find that Dark Confidant makes the deck. Most of the deck is 0-1 CMC, so you can safely have 2-3 of these on the field at the same time and still take less damage than most decks would from 1. The draw is incredibly helpful to prevent this deck from stalling out. Grim Lavamancer is a great way to use the cards in your yard, and follows up with the semi-burn game plan. A singleton Vedalken Archmage can really help you go off if you land it as well. You seem to have little in the way of drawing cards; Rhystic Study might be a great addition to the deck as it either taxes your opponent and slows them down, or you get free card draw. It seems a better use of a card slot than, say, Brass's Bounty. 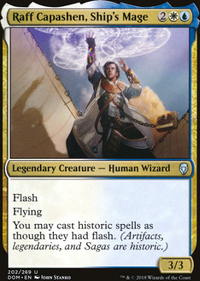 Similarly, you're missing out on cards like Vedalken Archmage that could also draw you more cards, and would function like a second copy of Jhoira. 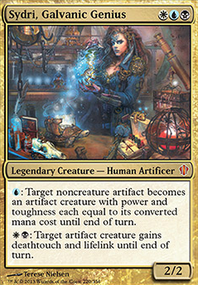 You could drop Sydri, for example, and it would probably improve the deck by allowing you to draw into more of your valuable cards. Sydri isn't exactly great without Caltrops or Aetherflux Reservoir, after all. Just a thought; hope it helps. 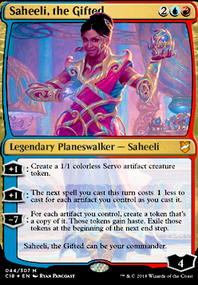 I feel I should note Panharmonicon does not work with Sai, Master Thopterist, Efficient Construction or Vedalken Archmage as those are triggered on cast, not on entering.